More known for country music and whiskey than as a hotbed for heavy metal, Tennessee is home to the thrash band Intruder. Live to Die is the band's 1987 debut release. This album laid the foundation for the band's deal with Metal Blade that would result in 2 subsequent full length releases, and an EP. Originally released on the Arza/Ironworks label, Hellion Records has re-released this album with all new artwork and 6 bonus tracks. The six bonus tracks are from the band's Transgressor (pre- Intruder name) era of 1984-1986. 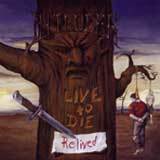 Intruder deliver what you might expect from a mid 80's thrash band. However, I must say that the music is well performed, while the vocalist is very talented and adds a lot of flavor to the music. The lead vocalist sounds very similar to Steve Grimmett (Grim Reaper, Onslaught), with an interesting hint of David King (Fastway) evident at times. Having said that, I suppose that is no surprise that this album immediately reminded of Onslaught's In Search of Sanity, which features Grimmett on vocals. The tone of the album is set by the speedy drum beats, which let up very sparingly throughout the album. Intruder sound very tight on this album, with the thrashy riffs coming across very intricate yet forceful. Moreover, flashy solos and shredding are not in short supply. All of this combined to give the band a very energetic, and aggressive sound (when needed). Songs such as Victory in Disguise and Live to Die display some variety in the band's songwriting. These two cuts feature noticeable time and tempo changes, which keep the sound fresh and prevent the whole affair from becoming repetetive. Kiss of Death even features a Spanish sounding, acoustic intro, before blistering into a full out thrash assault. Intruder also makes use of some shouted choruses (ala Master of Puppets, In Search of Sanity, Forbidden, et al). Furthermore, Intruder have figured out how to make each song catchy, without sacrificing any of the heaviness or speed. This album is more than enough to get your neck moving and keep it moving until the last note. Even at 72 minutes long (including the bonus tracks), I found that I could listen to this CD straight through without getting bored. Intruder knew how to write good thrash songs, and that's probably why Hellion Records decided to reissue this album along with some additional, previously unreleased material. Like most other thrash bands at the time, Intruder faded away in the early 1990's after the unfortunate rise of grunge. Fans of mid eighties thrash will surely find a lot to like with this album. Tight musicianship and all around pleasing songs will make this album a nice addition to any thrash fan's collection. The Transgressor (pre Intruder) bonus tracks included on this album are nearly, if not just as good as the Live To Die material. Hence, you're getting well over an hour's worth of music (14 tracks) on this CD. Not a bad bang for your buck in my opinion. As far as our quoting system goes, my 77 represents only the first eight tracks on this CD (the actual Live to Die album tracks). However, the strong quality of the six additional tracks makes this package much stronger and worthwhile.